Diego Simeone's men fell well short of the standards set in Tuesday's Champions League win over Borussia Dortmund and were fortunate to escape with three points courtesy of some late heroics against a side who have won just once in the league this season. 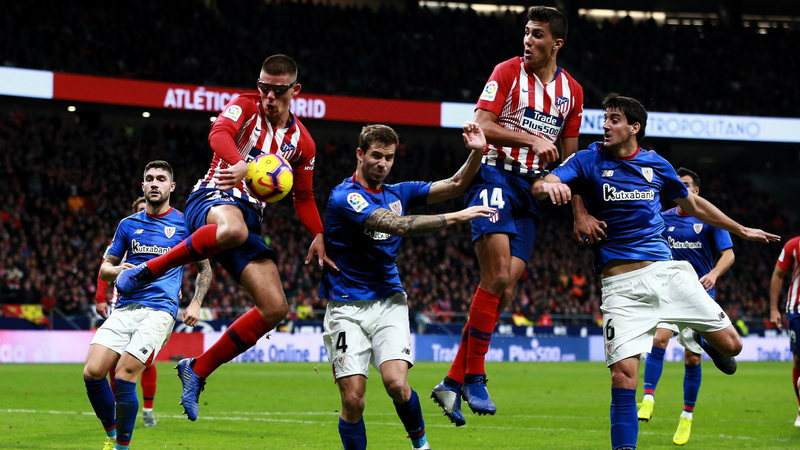 A surprise victory looked within their grasp, but Rodrigo's header 10 minutes from time and Godin's late intervention – awarded after a VAR review for possible offside – moved Simeone's side up to second, a point behind leaders Barcelona. The hosts' first-half sluggishness was punished before the interval when Williams prodded home on the line after Jan Oblak had superbly tipped Mikel San Jose's strike onto the underside of the crossbar. Williams should have added a second shortly before the hour mark, but his low effort was thwarted down low to his right by Oblak. The hosts pulled level after 61 minutes when Thomas' stunning 30-yard strike fizzed past Iago Herrerin, Filipe Luis with the assist. Their joy was short-lived, however, as Williams latched onto Iker Muniain's pass three minutes later to break clear of the Atleti backline and clip past the onrushing Oblak. Thomas then turned provider for Atleti's leveller after 80 minutes, his cross turned in by Rodrigo, before Godin unleashed wild celebrations – after a short delay for a VAR review – by nodding in Antoine Griezmann's flick on from close range one minute into added time. The feel-good factor of a stoppage-time winner will no doubt gloss over the fact that Atleti were poor against a side with only one win to their name this season. As it is, they are up to second and will remain there if Sunday's clash between Sevilla and Espanyol ends in a draw. Athletic, meanwhile, will be crestfallen, having come so close to a precious win and ultimately coming away with nothing. They remain in big trouble, just one point outside the relegation zone. The 24-year-old could not miss his first, tapping in from barely a yard, but showed superb pace and composure for his second to double his LaLiga tally for the season to four. The former Chelsea striker looks a shadow of his former self in his second spell at Atletico. He offered little threat to the Athletic backline, which is hardly surprising given that he has now gone a whopping 18 games without a league goal. Costa failed to register a single shot before being replaced at half-time. Simeone's side have a mouth-watering home clash with Barcelona to look forward to after the international break on November 24. If Barca beat Real Betis on Sunday, the gap will be four points. Athletic host Getafe on November 25 as they look to kickstart their season.